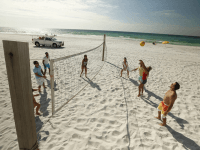 The abundance of outdoor recreation opportunities in and around our hotel in Sandestin is one of the reasons Hilton Sandestin Beach is considered one of the best family resorts in Florida. During your trip to our resort, take some time to enjoy the great outdoors with a walk, jog or bike ride. Stroll down the paved sidewalks within the resort complex or venture to nearby areas within South Walton — which has over 200 miles of walking and biking trails. 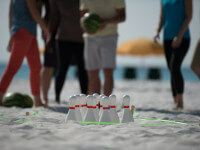 Below, three of our favorite routes we recommend you try during your next trip to Hilton Sandestin Beach. Just under 4 miles, this loop is conveniently located next to our hotel in Sandestin, Florida. Walk outside the doors to Hilton Sandestin Beach and you’re already on the path! Follow Sandestin Boulevard toward Highway 98, winding next to landscaped lawns and manmade lakes / fountain areas. Proceed to Sandestin Bayside and cross under Highway 98 at the one-mile mark through the pedestrian tunnel. Run around the two-mile bayside loop and back to Hilton Sandestin Beach. If you’d like to break up your run — stop by the Market Shops just before or after crossing Highway 98 for some retail therapy or a cold drink. A bike ride or walk is a great activity for the whole family. And our resort in Florida offers plenty of opportunities for some family bonding time outdoors. 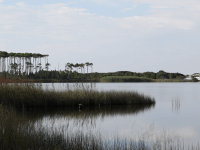 Nearby Topsail Hill Preserve State Park (less than 10 minutes from our hotel in Sandestin, Florida) has a variety of great hiking paths — all part of a trail system that extends over 15 miles. Walk or run through the Morris Lake Nature Trail, which winds around over two miles of ancient dunes and scrub communities. Many say this trail makes them feel like they are walking on snow. For a longer jog, try the Campbell Lake Nature Trail where you’ll find a five-mile path dotted with interesting plants and animals. Topsail Hill also offers on-site bike rentals if you prefer to roll through trails instead of run. Rent a bike for one day, a few days or a whole week. Tandem bikes and tricycles are also available. The Eastern Lake Trail System is located on the Eastern portion of Point Washington State Forest in South Walton County. The trailhead is located on County Road 395, just over a mile south of U.S. Highway 98 and about a 20 minute drive from Hilton Sandestin Beach. There is a small fee to enter the trail system, but it’s well worth it to experience the beauty of these trails that wind through sandhills, coastal sand pine scrub, longleaf pine flatwoods, cypress ponds, and wet prairies. Visitors can hike, run or bike through the park, which has an 11-mile, five-mile and three-and-a-half-mile loop. Take advantage of great walking, jogging and hiking trails in and around our hotel in Sandestin. Bring the whole family to our resort in Florida so you can enjoy the fun together!